Among the numerous evergreen climbing plants there is the Akebia with its Quinata variety with a pinkish color and purple hues. The plant has oriental origins: China, Japan and Korea; it has thin and flexible stems with small palmate leaves composed of five leaflets. Akebia Quinata has a very elegant appearance especially in spring when it blooms producing numerous flowers that hide in small groups among the green leaves. In summer it yields large fruits, also of violet color, which then reach the light brown of maturity; each berry finally tends to open longitudinally showing the white and creamy pulp composed of a large quantity of small black seeds. The specimens of this plant grow rapidly in a few years; they can reach heights of more than eight meters, climbing easily on houses, walls or cliffs. The speed of its growth makes it an often invasive plant, but the right cultivation and an appropriate pruning, will allow to have the right control. 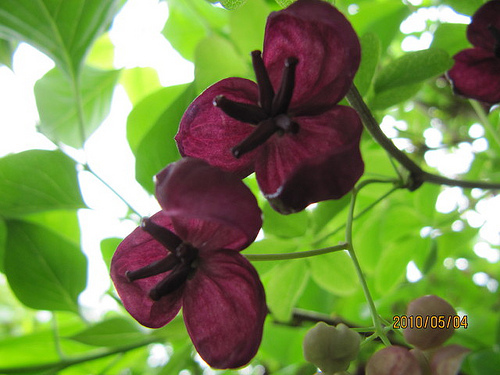 The akebia are really resistant plants and they can also bear very cold climates, but for a luxuriant growth they need a lot of sun, little wind and a well drained soil perhaps composed of soil and little washed river sand. Akebia Quinata does not require particularly deep soils and this can also be grown in large pots with a repotting every two years to allow the roots to have more space. In less sunny and shady areas will grow the same but will produce less flowers. These plants do not need special care and attention and are generally not affected by pests or diseases. With a good winter pruning it will grow luxuriant; in the spring it can instead be reproduced by seed or by semi-woody cutting. The young plants should be watered more regularly than the adult ones, these climbing plants can however withstand short periods of drought; those grown in pots require modest but frequent watering trying to avoid stagnation of water. To obtain a plant with numerous flowers you can use, every fortnight, the fertilizer mixed with water; to avoid possible pests, instead, plant protection products are used which immediately guarantee greater protection for the plant. In the West, the plant is used only as a decorative element, but in the countries of origin, akabia serves much more. Its resistant stems are used to weave small baskets; the leaves and the skin of the fruit are used in the kitchen to prepare decoctions with excellent diuretic power; moreover the oil extracted from the seeds is used in the field of cosmetics and medicine. The pods offer a pulp that smells of vanilla and which, if separated from the black seeds, becomes edible and can be used in the kitchen, for example in salads; then thanks to its sweetish taste it can enrich the taste of a yogurt or a juice. Akebia Quinata is not particularly caloric, has many nutrients and also seems to have many anti-inflammatory properties, but should be consumed in small doses.